My hubby got me a surprise gift from Deals.com.sg for Valentines Day. 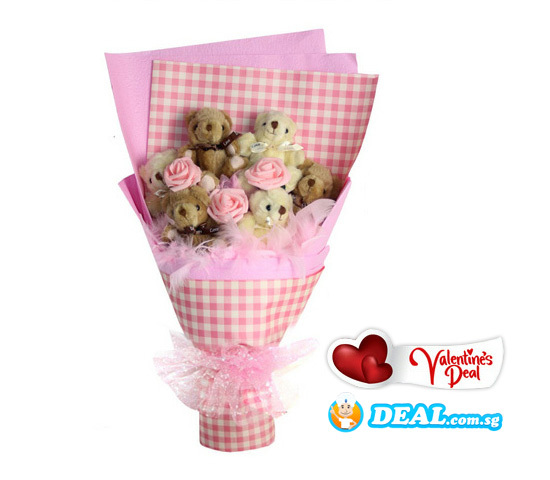 It's a bouquet of small teddy bears. 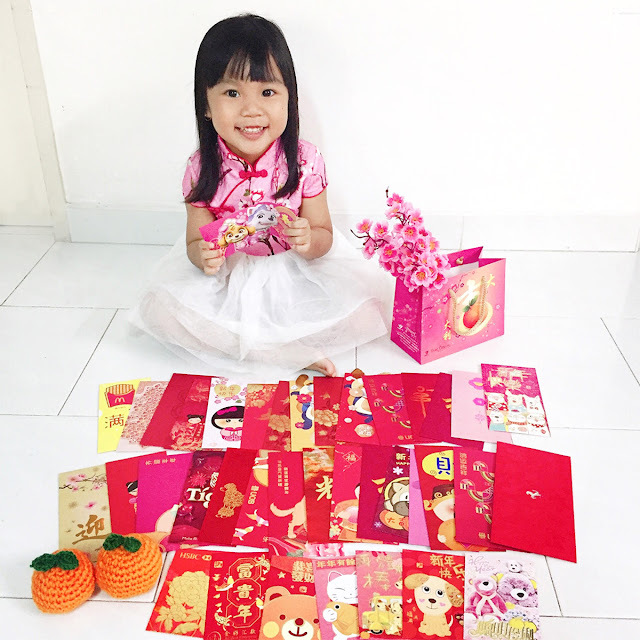 What comes as a bigger surprise was that despite the deal being titled with the intention to sell as a Valentines' Day gift, the bouquet did not come on the actual day. I only received it 12 days later. Delivery, and overall experience aside, I love the bouquet. It's very sweet. 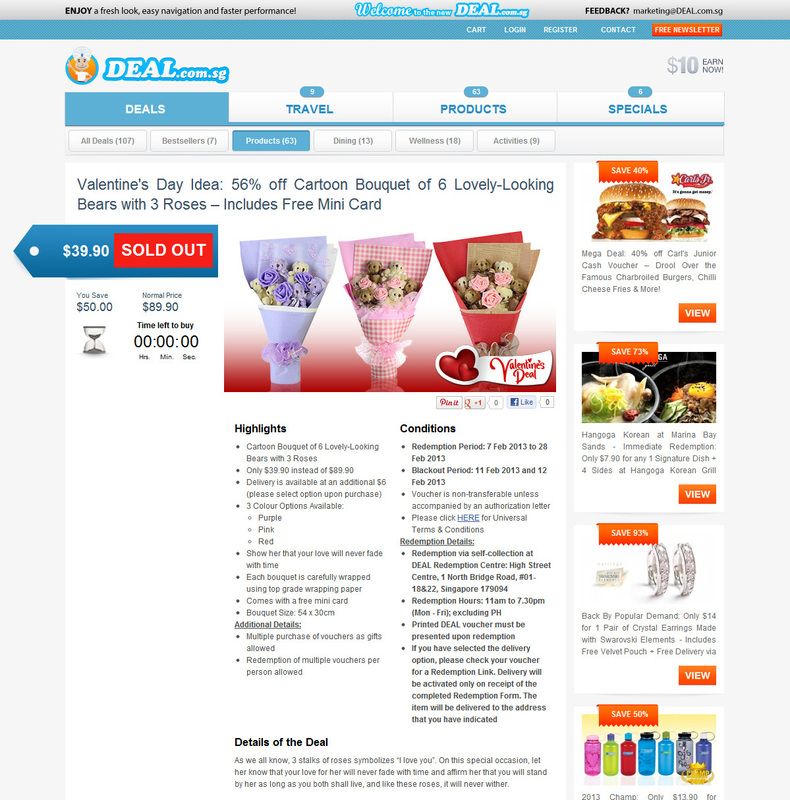 My hubby purchased the bouquet online via this deal site, Deals.com.sg and indicated in the remarks to state that the delivery is to deliver to my office address on 14th February. But to his horror, on the actual day, I did not receive any bouquet and he felt sorry to me. He called Deals on 14th February and the answer he got from the phone call was "The delivery will not be taking place on 14th February and the delivery is done in batches and will be send out during the period of February. And despite putting the preferred delivery date, it does not confirm the delivery will be on that day. " A deal, titled as "Valentines Day Idea", meaning to get customers to buy the item as a Valentines Day gift, isn't it meant to let the recipient receive it on the actual day? This is the deal published on Deals.com.sg. 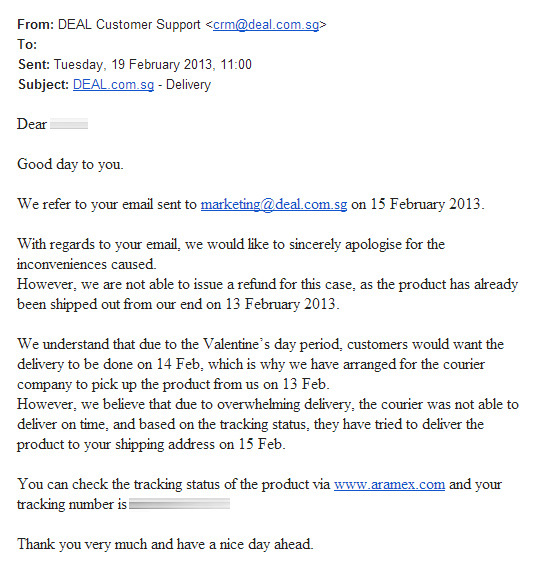 My hubby sent an unsatisfactory experience email to Deals.com.sg on the 15th February. Here's the tracking history of the the entire process my gift went through. The customer service said that the courier attempted to send on the 15th February 6:51pm, but indicated that no one was around. Sad to burst their bubble, but I was working overtime on 15th February and only left after 7pm. And there are other colleagues around even after I left. Even so on the 18th February. Both days I was working late. My hubby replied on the same day, highlighting that we are not asking for refund, but we just need answers and the item to be DELIVERED. It was already 5 days past Valentines Day. And in the second reply email, Deals.com.sg pushed everything to the delivery company. I understand that it's out of their control after items are dispatched to the delivery company. But still, the entire process was horrible. I only wanted things to be fixed and get my gift that my hubby had bought for me. I gotten my gift 12 days later and Aramex is the delivery company. This is my first negative post. I do not wish to post negative blogposts, at most, I would just not blog about it. But we were so disappointed with the entire process that I just wish to share. Maybe it's not really anyone's fault, but, I still feel disappointed. After this incident, and the incident with the Donut Maker deal purchase (View post - to be updated), I do not think that I would want to buy any more things from Deals.com.sg. I am just too disappointed.